Stacey Viera is a writer and photographer based in Arlington, Virginia. Combining her passions for eating well, eating right, and educating people about nurturing lifelong healthy relationships with food, Stacey publishes EveryFoodFits.com, offering simple and fulfilling recipes since 2008. A D.C.-area native, she also helps facilitate educational opportunities for the public as a Master Food Volunteer with the Virginia Cooperative Extension. In addition to this tasty food blog, she has an online portfolio at www.StaceyViera.com. Inquiries are welcome: everyfoodfits AT gmail.com. Follow Stacey and EveryFoodFits on Twitter. When labeling foods as good or bad, we carry those biases into our daily eating habits and lose out on some of the pleasure and enjoyment of food and the overall eating experience. We set ourselves up for failure when we deprive ourselves. It’s simply not worth it. If we are incorporating a wide variety of foods, then there is room for everything – even if it’s only a bite! The information in this blog is intended to be entertaining and educational and should not be considered a replacement for medical advice from a licensed physician or a replacement from comprehensive nutrition advice from a licensed dietitian. 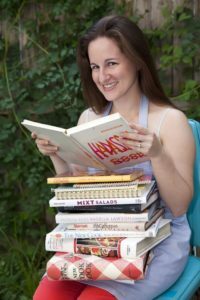 All of the material – including all photography – on the Every Food Fits blog is copyrighted by Stacey Viera. Please link to the site if you wish to share the materials with others or submit queries to everyfoodfits AT gmail.com.